Chinese philosophy originates in the Spring and Autumn and Warring States eras, during a period known as the "Hundred Schools of Thought", which was characterized by significant intellectual and cultural developments. Although much of Chinese philosophy begins in the Warring States period, elements of Chinese philosophy have existed for several thousand years; some can be found in the Yi Jing (the Book of Changes), an ancient compendium of divination, which dates back to at least 672 BCE. 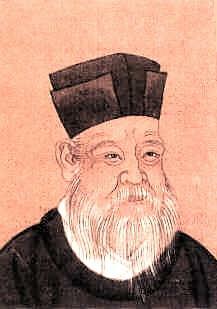 It was during the Warring States era that what Sima Tan termed the major philosophical schools of China, Confucianism, Legalism, and Daoism, arose, along with philosophies that later fell into obscurity, like Agriculturalism, Mohism, Chinese Naturalism, and the Logicians. Confucianism is a philosophical school developed from the teachings of Confucius collected in the The Analects, and of Mencius in The Mencius and Xunzi in The Xunzi. It is a system of moral, social, political, and religious thought that has had tremendous influence on Chinese history, thought, and culture down to the 21st century. Some Westerners have considered it to have been the "state religion" of imperial China. Its influence also spread to Korea and Japan. 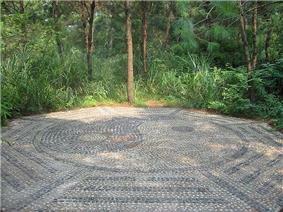 The major Confucian concepts include rén 仁 (humanity or humaneness), zhèngmíng 正名 (rectification of names; e.g. a ruler who rules unjustly is no longer a ruler and may be dethroned), zhōng 忠 (loyalty), xiào 孝 (filial piety), and li 禮 (ritual). 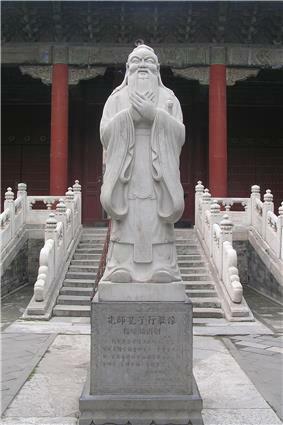 Confucius taught both positive and negative versions of the Golden Rule. The concepts Yin and Yang represent two opposing forces that are permanently in conflict with each other, leading to perpetual contradiction and change. The Confucian idea of "Rid of the two ends, take the middle" is a Chinese equivalent of Hegel's idea of "thesis, antithesis, and synthesis", which is a way of reconciling opposites, arriving at some middle ground combining the best of both. Fa (法 fa3): law or principle. The Realpolitik of the Warring States period was highly progressive, and extremely critical of the Confucian and Mohist schools. But that of the Qin Dynasty would be blamed for creating a totalitarian society, and thereby experienced decline. Its main motto is: "Set clear strict laws, or deliver harsh punishment". In Han Fei's philosophy the ruler possessed authority regarding reward and penalty, enacted through law. Shang Yang and Han Fei promoted absolute adherence to the law, regardless of the circumstances or the person. Ministers were only to be rewarded if their words were accurate to the results of their proposals. Legalism, in accordance with Shang Yang's interpretation, could encourage the state to be a militaristic autarky. 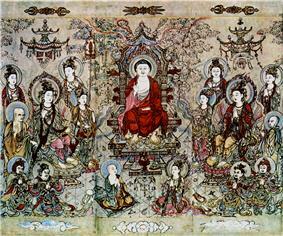 Ming Dynasty was the School of Mind revived by Wang Shouren, whose influence is equal to that of Zhu Xi. This school was particularly important in Japan. Despite Confucianism losing popularity to Taoism and Buddhism, Neo-Confucianism combined those ideas into a more metaphysical framework. Its concepts include li (principle, akin to Plato's forms), qi (vital or material force), taiji (the Great Ultimate), and xin (mind). Since the radical movement of the Cultural Revolution, the Chinese government has become much more tolerant with the practice of traditional beliefs. The Japan, philosophy in China has become a melting pot of ideas. It accepts new concepts, while attempting also to accord old beliefs their due.